We began in 1913 as the “Dallas Baby Camp” housed in four donated tents. Today, Children’s is the fifth-largest pediatric hospital and the second-busiest pediatric emergency room in the nation. Our various facilities receive nearly 750,000 patient visits annually from all 50 states and around the world, as we work to provide the right care in the right place at the right time. Children’s plays a pivotal role in addressing our community’s needs. We provide approximately $157 million annually in community benefits, half of which is charity care, with no tax support from the city or the county. We never turn a child away because the family is unable to pay for medical care. 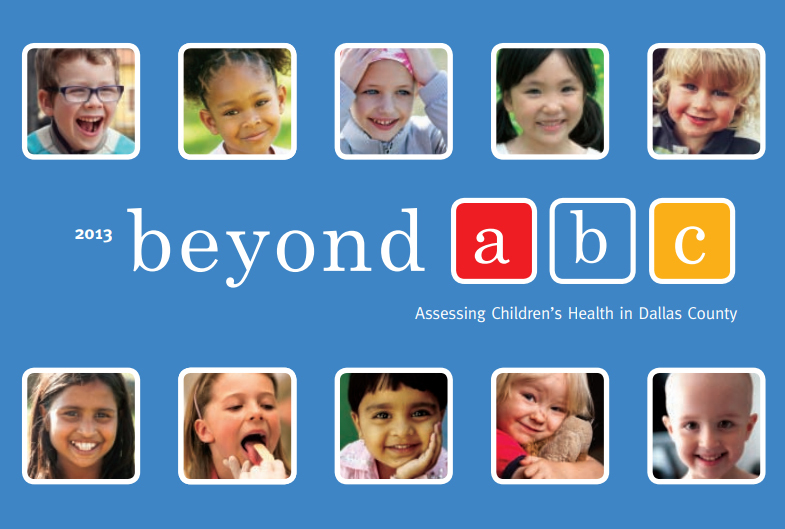 Beyond ABC offers a foundation for understanding the socioeconomic and health issues that face our children. For example, approximately 30 percent of Dallas County children live at or below the federal poverty line, with an annual income of $23,550 for a family of four. In the past decade, that percentage has risen 6 points. Poverty is the common factor in substandard academic achievement, exposure to crime, domestic abuse and emotional distress. Without access to preventive health care, impoverished children also suffer from needless illnesses. Children’s Medical Center 12. 12 Nov. 2013. Web. 10 July 2014.